—In that case, why do you preface them? Not to provide the key and demonstrate their unity, but rather to make them drift a little more than they seem to. What should be suspected is their apparent unity: their collection is interesting insofar as some elements remain uncollected. . . . Critique must be drifted out of. Better still: Drifting is in itself the end of all critique. What we are? and Whither we tend? We do not wish to be deceived. Here we drift, like white sail across the wild ocean, now bright on the wave, now darkling in the trough of the sea;—but from what port did we sail? Who knows? Or to what port are we bound? Who knows? 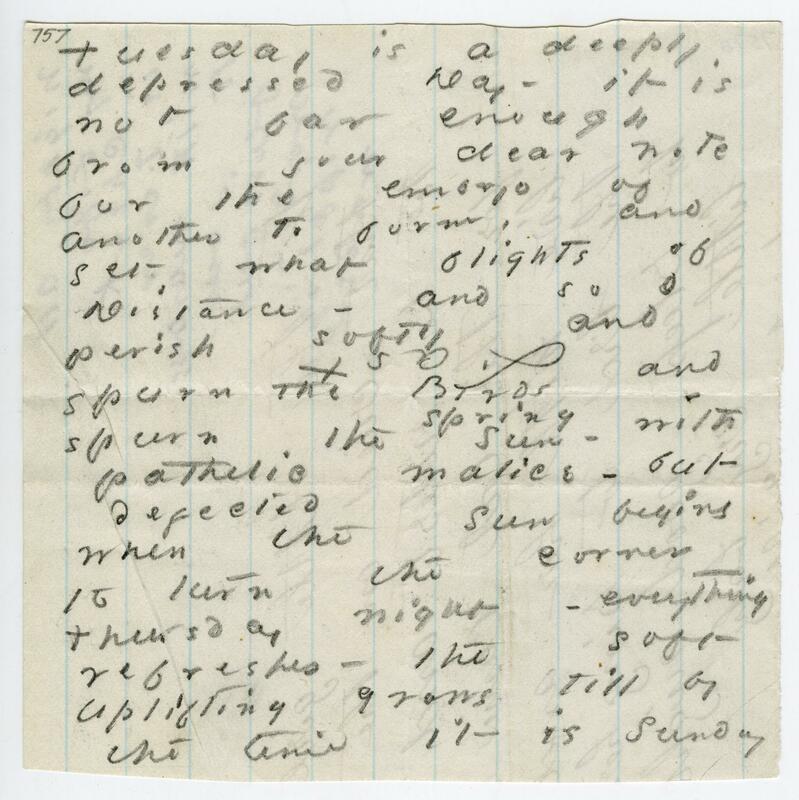 There is no one to tell us but such poor weather-tossed mariners as ourselves, to whom we speak as we pass, or who have hoisted some signal, or floated to us some letter in a bottle from far. But what know they more than we? They also found themselves on this wondrous sea. The wind had blowe ouer the leef / at the tyme of translacion of his booke. Today more than one hundred years interpose between the reader-scholar and this scene of composition, between the original drafts and the witnesses in the drift of time. The darkening of the manuscript pages, the smudges and tears, the bewildering of leaves, even the catalog numbers written on them in a foreign hand, remind us of our distance from the original scene of inscription and the limits of interpretation. When were the drafts and fragments discovered? And by whom? Did fair copies lie with fair copies and rough with rough, or all together? How many leaves are missing? Who cut them, and for what purpose? In the drift of time phrases and words are reordered and return as parts of different messages; our answers are also guesses, gone astray. 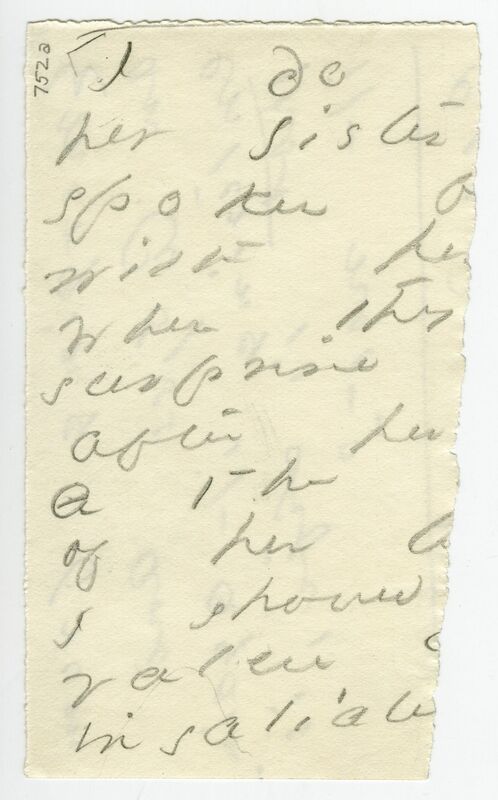 According to Bingham [Todd], the drafts and fragments had been entrusted, possibly by Dickinson herself, to her brother Austin, who, in turn, passed them on to Mabel Todd, his lover and the first editor of Dickinson’s writing: “One packet brought by Mr. Dickinson was different from all the others. 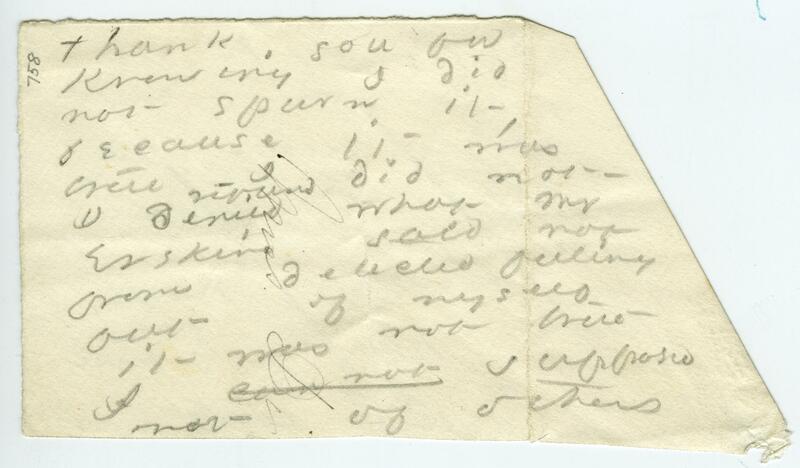 In a used brown envelope, addressed in an unknown hand to ‘Miss E. C. Dickinson, Amherst, Mass.,’ the canceled stamps an issue of the early 1880s, it is labeled in my mother’s writing, ‘Rough drafts of Emily’s letters.’ . . . Obviously love letters, my mother did not ask Mr. Dickinson how they came to be in his possession, wondering though she did how they could have escaped destruction.”7 After Todd’s sudden death in 1932 the cache of manuscripts, undisturbed since the 1890s, was passed on to Bingham even as a secret is passed on—infinitely promising, absolutely unrecoverable. Several years of research in Salem, Massachusetts, the site of Lord’s home, failed to confirm either the story of Dickinson’s illicit love or bring new documents to light, and in the end Bingham was simply left with the miscellaneous papers her mother had declined to publish. At the far end of A Revelation the “supplementary rough drafts” elude their editor’s resolve and set both book and reader adrift on another course. Thomas H. Johnson’s three-volume edition of Dickinson’s Letters is the only complete scholarly edition of Dickinson’s letters currently available, and it naturally includes the Lord letters. Instead of clarifying the textual and transmission histories of the writings in question, however, Johnson complicates them even further. 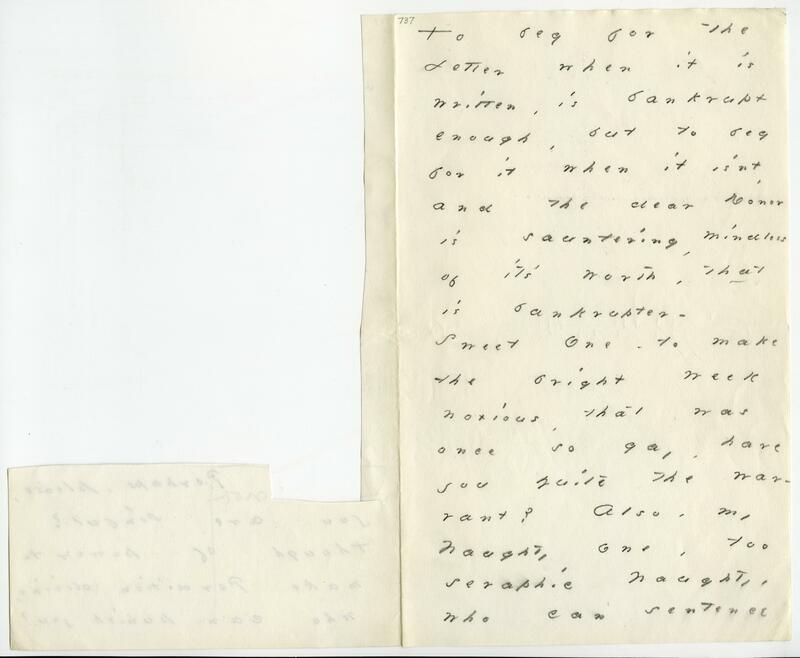 For example, in the note following L 559, the first of the drafts appearing in his edition, Johnson repeats Bingham’s [Todd’s] version of the letter‑fragments’ provenance and discovery: “The letters, and drafts and fragments of letters, to Lord were found among ED’s papers after her death, and given to Mrs. Todd by Austin Dickinson. (Revelation, 1–2).” And yet, in the (silent) process of reediting the manuscripts, Johnson reimagines both the dimensions of the correspondence and the boundaries of individual drafts. 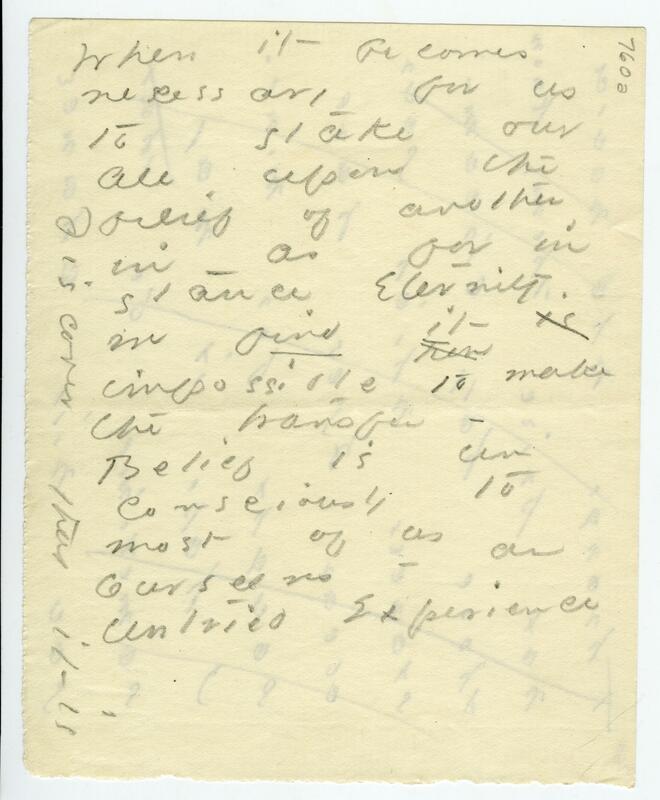 Like Bingham, Johnson divides the manuscripts into two groups, the first consisting of those drafts he believes were almost certainly intended for Otis Lord and the second of writings peripherally associated with him. 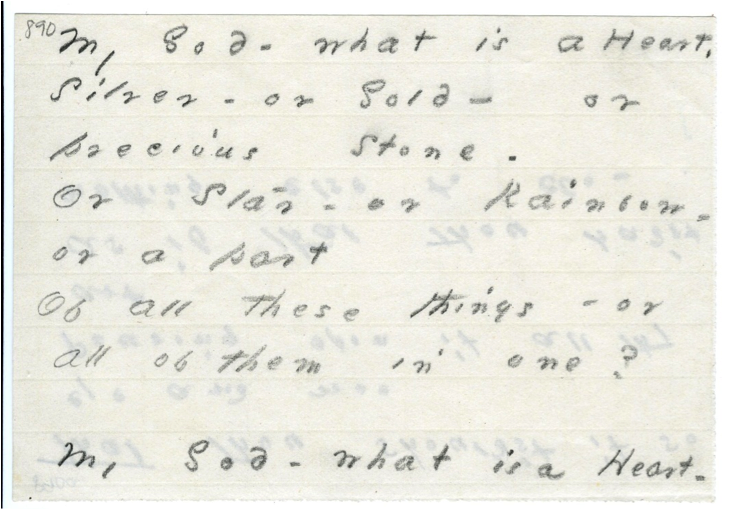 Drafts and fragments belonging to the first group are placed in the body of Letters, while drafts and fragments belonging to the second group are relegated to the final section of Letters headed “Prose Fragments.” In making his selections for the first group, however, Johnson did not limit his choices to the fair copy letter‑fragments in part 1 of A Revelation but, instead, chose freely from both groups, thus bewildering Bingham’s lines of division and altering the status of a number of drafts in the process. If Johnson’s division of the manuscripts is the result of new “scholarly” discoveries, textual or historical, his annotations never record them. Moreover, his division of the manuscripts affects their status in a way Bingham’s does not: by including a significant number of the fragments in the main body of Letters, Johnson effectively conceals their status as working papers or extrageneric events falling outside standard taxonomies. 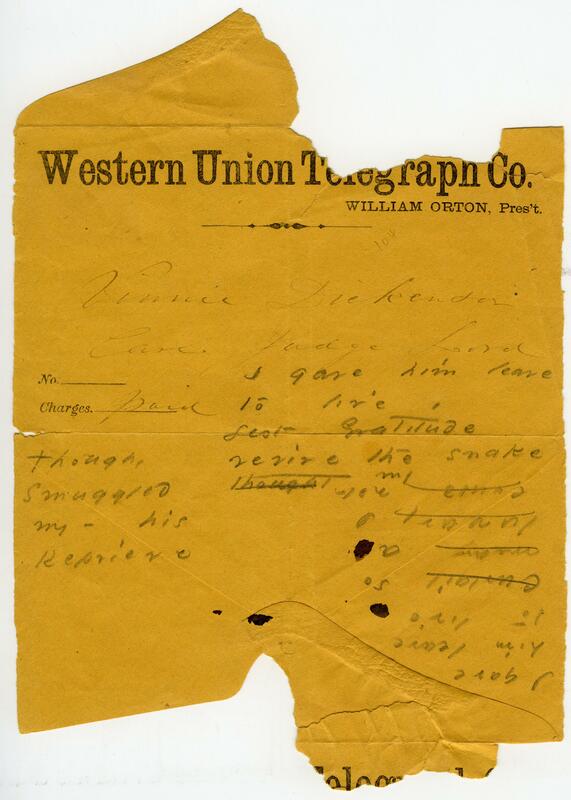 At last his own heading, “To Otis Lord,” usurps the space of address Dickinson chose to leave empty, or open. Though the editorial interventions that resulted in the arbitrary regrouping of the drafts and fragments and gave them the look of finished texts are clearly problematic, Johnson’s gravest error is a far more intimate one, involving as it does the misrepresentation of the contents, internal order, and borders of a number of individual documents. Again and again, nostalgia for a lost “original” or perhaps only the scholar’s desire for mastery, the “darkling appropriation” of his subject—a text, a woman—leads Johnson to turn away from the rich surfaces of the manuscripts themselves. Ill at ease with Dickinson’s open-endedness and with her willingness to operate outside the conventions of plot, this editor occasionally finishes her drafts. 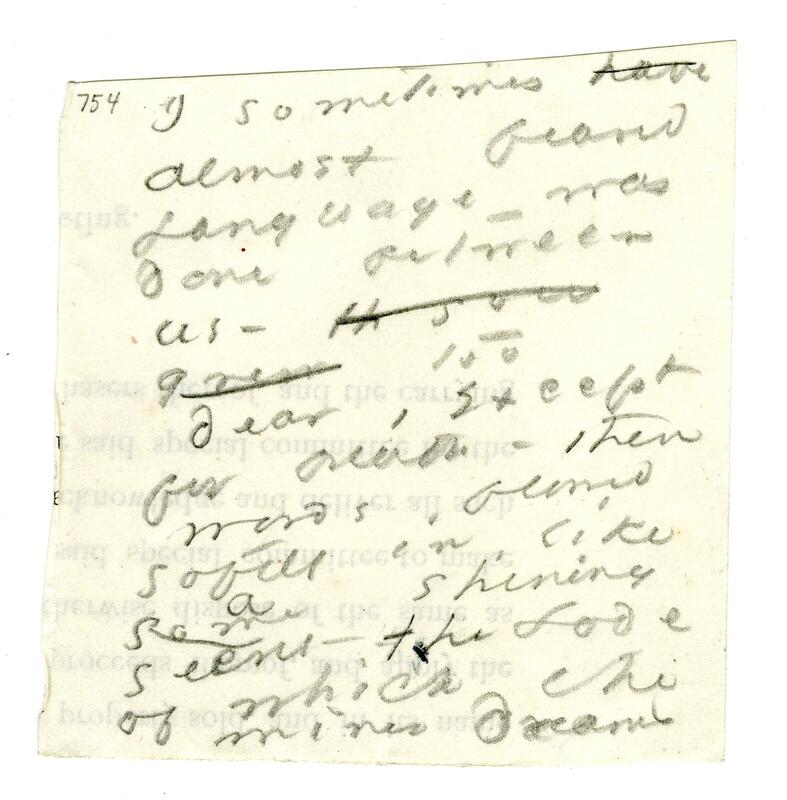 At times Johnson splices together discrete fragments, rearranging text in order that the progress of each “letter” may be free of ambiguity, in order that there may be a “beginning,” “middle,” and “end.” At other times completing a text amounts to “constructing” one out of the myriad of rough and fair copy drafts available. After a generation the scars of Johnson’s “method” have become both deeper and less apparent: buried beneath the surfaces of the texts, they have become structural, even genetic. In one exhibition featured here (“The Johnson Reconstructions”) I have tried to re-trace his specific moves, case (fragment) by case (fragment). But what is really at stake is something greater than any one of the reconstructions reveals: at stake are the very structures employed to enclose Dickinson in a narrative not of her own making, to keep her in her by now canonical place. Today the drafts and fragments, arranged in a chronological narrative, bound into the uniform pages of a book, lie becalmed, their “beautiful difficulties” silenced. And over the same span of time the narrative—another Master Narrative of the incorruptible text and the single lover—has come to shape our accounts of these fugitive works on paper and of a writing otherwise. 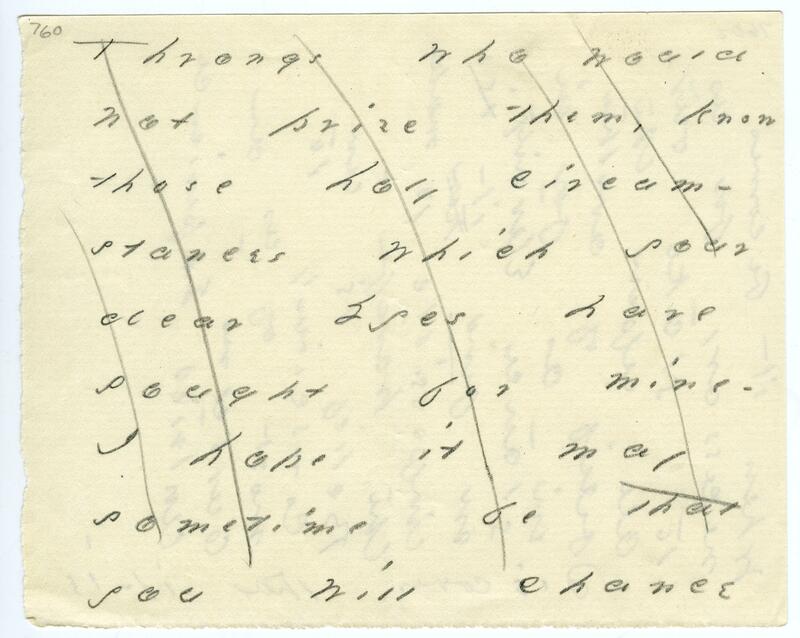 Thomas H. Johnson: All autograph letters are presented in their verbatim form. In The Textual Condition Jerome J. McGann reminds us, “To edit a text is to be situated in a historical relation to the work’s transmissions, but it is also to be placed in an immediate relation to contemporary cultural and conceptual goals.”12 The historical and cultural ideas of authorship and authority along with the definition of the work of art current in the 1950s inevitably impinged upon Johnson’s scholarly project. In the end he, too, was at the mercy of time and the categories time revealed to him. In his edition of Dickinson’s writings Johnson’s idealist view of textual scholarship and his aesthetic expectations influenced his editorial decisions. A poet’s “violation” of accepted generic patterns in her drafts and fragments revealed for the editor of her work an “error” in the material documents. 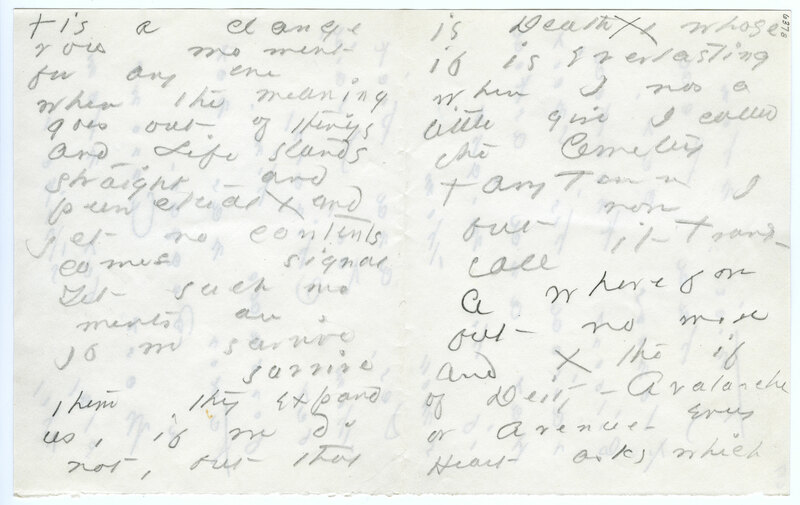 His judgment rendered these drafts “letters,” and he arranged them in paragraphs. To what end would a reading without respect for the boundaries demarcating and dividing “poems” from “letters” from “fragments” drift? n. 1. a drawing, sketch, or design. 2. a first or preliminary form of any writing, subject to revision, copying, etc. 3. act of drawing; delineation. 4. a current of air moving in an upward or downward direction . . . There is something unsettling, even disturbing, about publishing Dickinson’s late drafts: the extreme privacy of their revelations, their illumination of an uncontrolled interior, seem to situate them on the “wrong side of the aesthetic boundary,” and, to the question to which this edition continually returns, “What is a work?” these uncollected leaves whisper, “A theory of the work does not exist.”13 For, in the strictest sense, there are no letters to Lord—only drafts and sketches, traces of writings pieced together from an unknown number of sources. Outside the collections in which they have been so arbitrarily enclosed and beyond, too, an encumbering editorial apparatus, these lost events, or “memor[ies] for the process of text production itself,” will be restituted to their boundlessness.14 Then the proper name (or is it, rather, an exclamation?) “Lord” will no longer act as a delimiter but will only indicate one possible course of approach. What is a draft but an intruder? Changeling or boundary figure on the extreme periphery of canonical discourse. 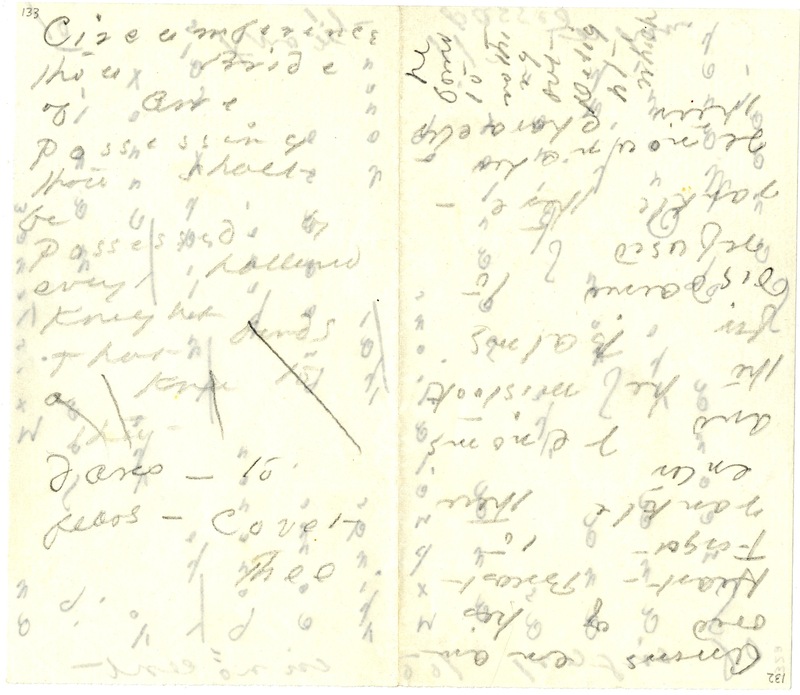 The dating of Dickinson’s undated drafts and their arrangement in chronological order in Johnson’s Letters is not only a way of “bracket[ing] her artistic objectives as autobiographical” but also a way for the orthodox editor to short‑circuit their mobility and potential for transfiguration.18 By assigning the drafts to specific years and printing them as part of a continuous narrative, Dickinson’s editors have chosen to ignore the interior time of the draft itself, which registers, without ever coming to rest, the backward and forward motions of the composing mind. With the exception of four manuscripts that can be precisely dated on the basis of internal and external evidence, then, the order of Dickinson’s drafts would ideally be left entirely open. No longer limited by the codex format, the rectilinear notion of time would then give way to a discursive—wandering—seriality: each discrete draft, unpaginated and only provisionally bound, would drift and interchange with the others. In place of “introductions,” which inevitably set borders between “lost events,” there would be genealogies, gray areas, in which beginnings and endings blur; blank or inkless pages, like negative messages, would mark time, duration, in the outside. In the future some of the drafts might slip from the initial constellation altogether, while others, now marked as “prose fragments” or “scraps,” might enter it, producing not collections but, rather, unforeseen and anomalous orders. Just as writing in the open portfolio would reveal the speciousness of teleologies, reading in the open portfolio must always be in medias res: opening the folder at random and sifting its contents, the reader finds himself or herself at once “elsewhere” and “before” a page that appears as a visual field of signals and upon which generic divisions dissolve. Take for a moment the case of A 440 and A 440a, two rough copy pencil drafts on the recto and verso of a strip of off-white wrapping paper, the edges of which are jagged where they have been torn and scissored. 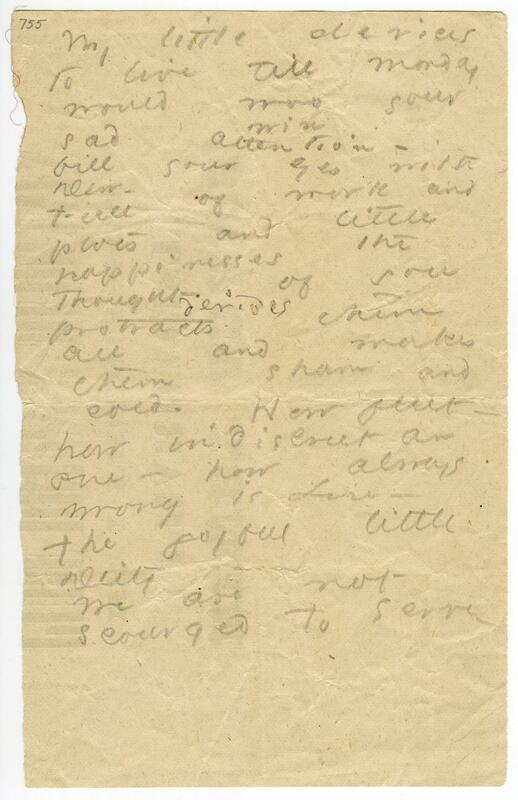 Here two drafts, materially linked, are half-messages, each partially lost beyond the tear in the paper. figure 1: A 440, A 440a, c. 1883. Lines penciled on both sides of a strip of off-white wrapping paper, approximately 55 x 295 mm. Reproduced by permission of the Trustees of the Amherst College Library, Archives & Special Collections. Instead of labeling one draft a poem and the other a letter, as Johnson does, why not describe the gesture of both inscriptions, the way the words compose themselves on the thin strip, the turbulence of the mind passing into pencil strokes, the liminal organization of letters in “space, time, matter”?19 By approaching Dickinson’s writings in this way, I hope to reveal both their hermetic singularity and their radical dispersion, while also understanding, seeing, this dispersion as a way of phrasing—the phrases of leaves. To an editor seeking authority, not inconsistency, [Dickinson’s dashes and marks of punctuation] appear to have none. To the biographer or the curious, they would be, if properly dated, merely the historical record of a passing performance. The only access the reader ever has to the literary work of art is his or her own performance of it. The authority of calligraphy is antinomian: print never can appear in its likeness. 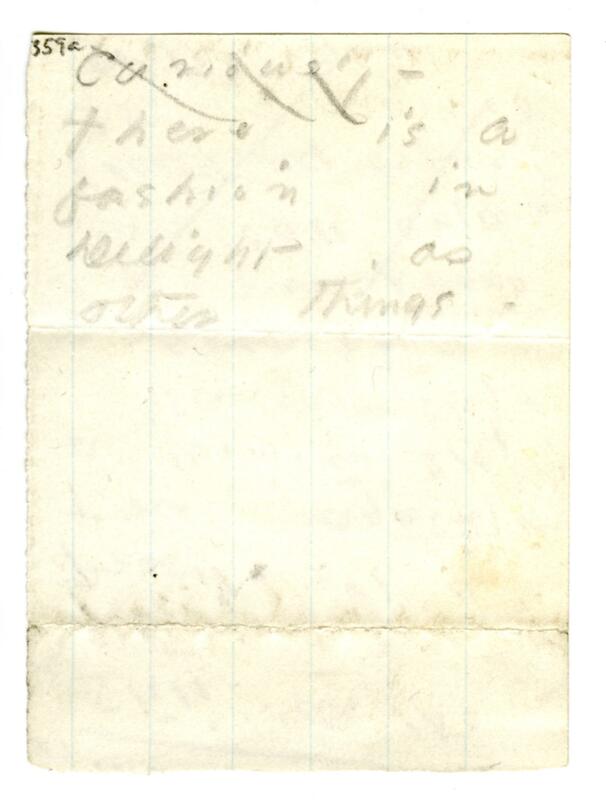 If Dickinson’s punctuation, particularly her free use of capitals and dashes, reflects the “fashions of . . . nineteenth‑century handwriting, particularly that of women,” it also inscribes her separation from “the male‑dominated production and distribution processes of typographic culture.”20 Something immediate and alien refuses to be retraced in type. The crosses of Dickinson’s Ts, the flowing descenders of her ys and curling ascenders of her ds, the ambiguity of her majuscules and the angles of her dashes, as well as the irregular spaces between letters and words and the many unrecorded evolutions of isolated signs, are, in effect, untranslatable. figure 2: Stanza two of “Matins” by George Herbert, translated by Dickinson in the last decade of her life. 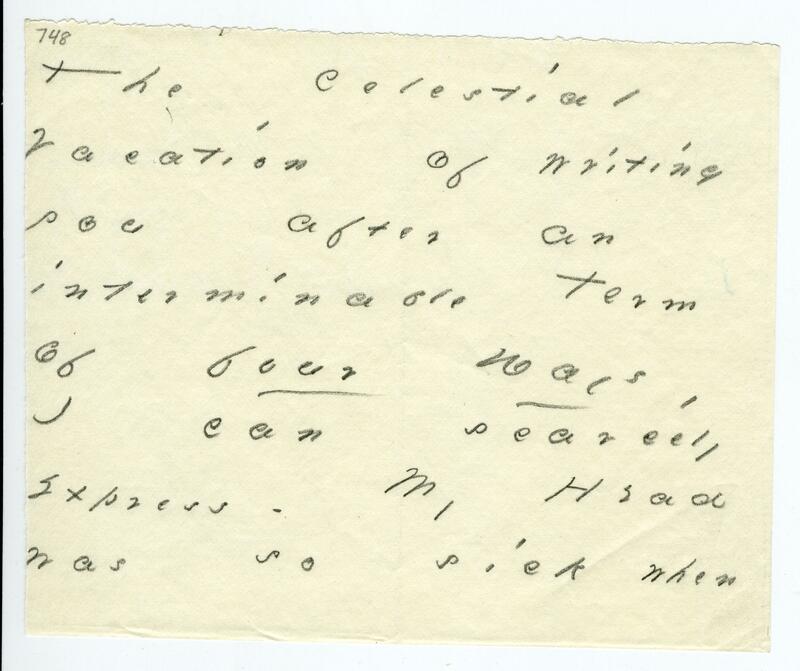 Reproduced by permission of the Trustees of the Amherst College Library, Archives & Special Collections. Against an editorial and a critical tradition that has “normalized text” and focused primarily on its signs, I have introduced facsimiles to “abnormalize readers” and to emphasize the iconicity of the manuscript pages themselves.23 In my transcriptions no mark of punctuation has been changed, no line break altered, no paragraph breaks assumed, no ordering of variants undertaken, no closure sought. 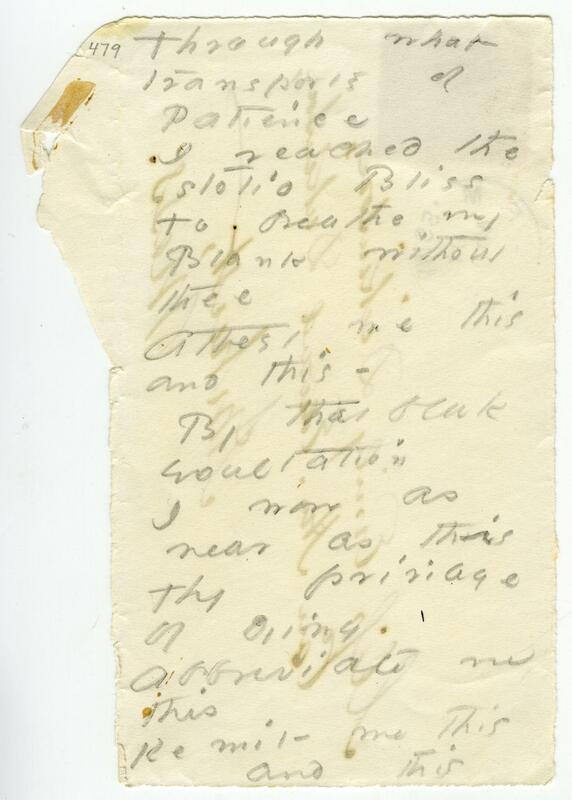 On the contrary, I have stayed by all vagrant spellings, stray marks, and disturbances—drives, tractions—on the surfaces of the manuscripts in the belief that they will lead me ever deeper into the process of Dickinson’s thought‑passage. “Accidentals”—dashes, flying quotation marks, underlinings, and other flourishes—I chose to add by hand, the regularizing effect of type utterly erasing their instantaneousness and force. 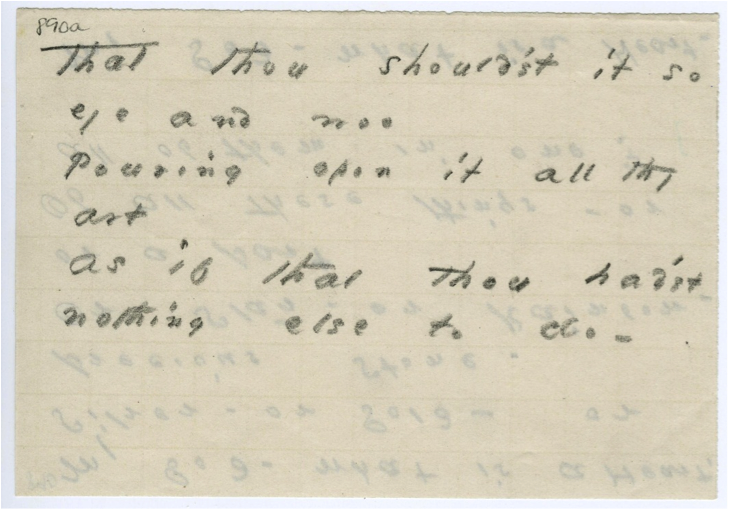 In transcribing the rough copy fragments, often composed on both sides of scraps of paper or household refuse, I have focused on Dickinson’s relationship to the edge, indicating the ways in which an inscription is at times shaped by the contours of the writing surface itself—by the seal of an envelope, for instance, or by the jagged edge of a scrap of stationery. 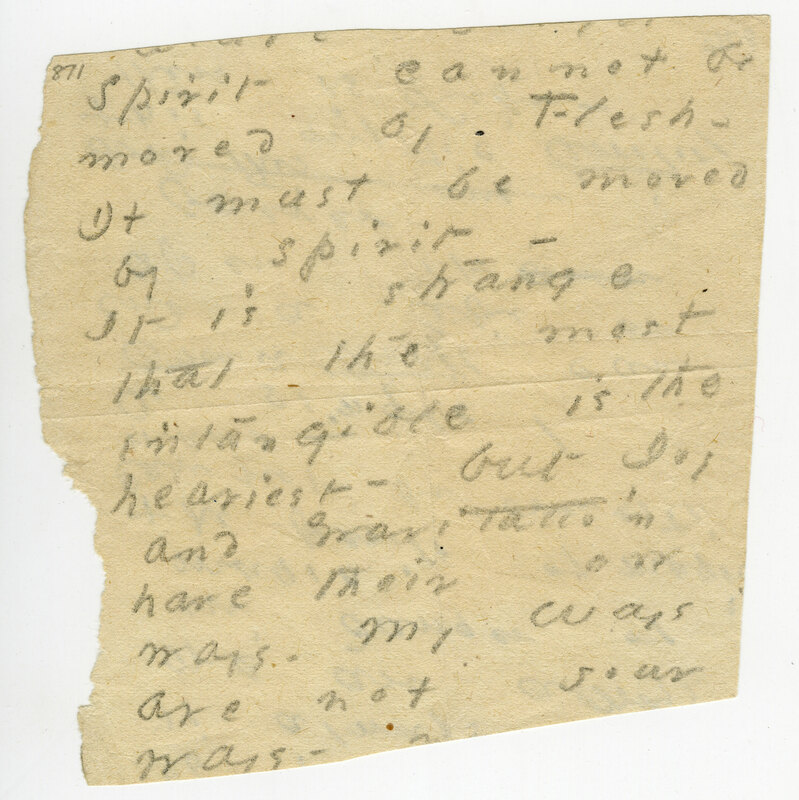 In transcribing the fair copy fragments, almost all of which were composed on leaves or partial leaves of fine stationery, I have focused on their vibrant stillness, an effect accomplished by Dickinson’s isolation of words in white space, and by her composition of the page as a “floating sky” of visual echoes. Although the representation of a suspense, or an interval, is perhaps not quite attainable in type, these transcripts strive to express Dickinson’s spatialization of time, her visual evocation of the future perfect in which polemics dissolve and strife passes away in the direction, if never the fulfillment, of parousia. The new figure that the drafts and fragments make may be so open and anticanonical that it will not at first be recognized as Emily Dickinson. Indeed, it is not Dickinson but, rather, a witness from the future of her work—in another time, in another medium. For, like the remains of Sappho’s ecstatic texts, recorded on fragile papyrus leaves only to be torn into vertical strips and columns of words centuries later, Dickinson’s late, ecstatic writings survive only in and through the process of translation.24 This edition, far from being definitive, is only one possible rendering of forty of her late documents—a forwarding of these message-events in another language. Each successive translation of these writings will liberate a host of previously unseen details, solicit a set of insoluble ambiguities. In this way the realization of a utopian edition of Dickinson’s drafts will be endlessly postponed, while a kind of communication—between text and reader, reader and writer—beyond mere consumption will perpetually open. Under what imprint, or what sky, these “living transcriptions” will ultimately appear cannot be guessed. Genealogy is gray, meticulous, and patiently documentary. It operates on a field of entangled and confused parchments, on documents that have been scratched over and re‑copied many times. . . . [I]t must record the singularity of events outside any monotonous finality; it must seek them in the most unpromising places, in what we tend to feel is without history—in sentiments, love, conscience, instincts. . . . Genealogy does not pretend to go back in time to restore an unbroken continuity that operates beyond the dispersion of forgotten things. . . . On the contrary, to follow the complex course of descent is to maintain passing events in their proper dispersion. Where do we find ourselves? In a series of which we do not know the extremes, and believe that it has none. 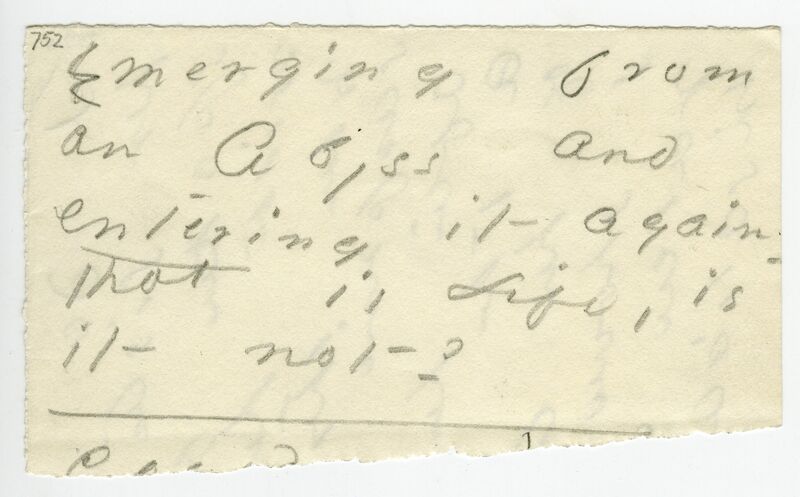 The manuscripts of the drafts and fragments reproduced here have their provenance in the Emily Dickinson Collection of the Amherst College Library, Archives & Special Collections (nos. 132, 133, 193, 194, 359, 440, 479, 637, 638, 734–61, 842, 843, 855, and 871). The documents, a gift from Millicent Todd Bingham, were first described and cataloged by Jay Leyda in the 1950s, at which time the vast majority of them were bibliographically linked with the “Otis Lord” correspondence, though some only very peripherally or tentatively. 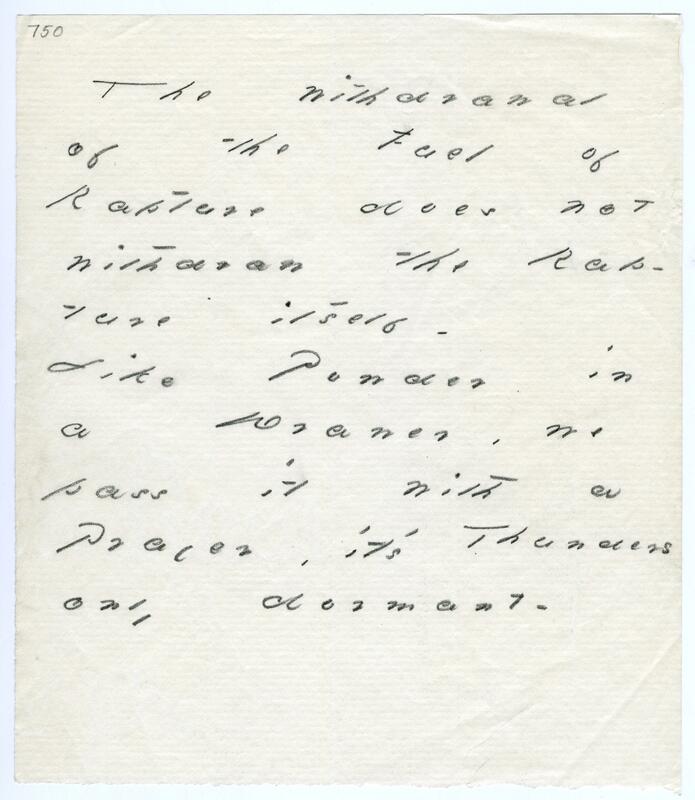 In “Open Folios” the drafts and fragments serve primarily as a point of entry into a late, brief scene of Dickinson’s writing.25 Left unfinished at the time of her death, they are not so much Dickinson “autographs” as symptoms of the processes of composition that can never be said to achieve closure, or the materials for a biography of style. 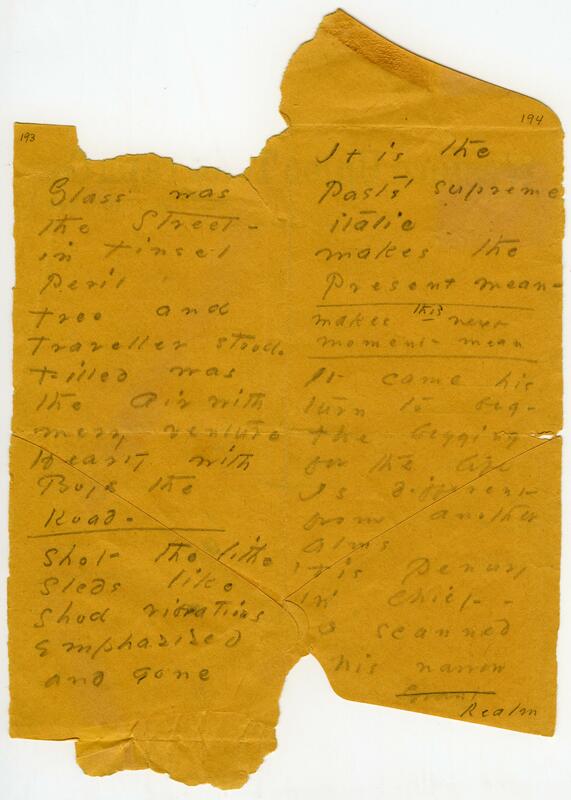 Many of the drafts and fragments appear to have begun as letters and later turned into working papers; others are more clearly poem drafts, traces of which will almost certainly reappear in other contexts. The transcription of each material document completely and without regard for traditional generic categories, a practice that runs counter to all previous editorial treatments of these materials, reveals a number of hitherto unknown texts and challenges us to discover or invent a terminology to describe their forms.26 Finally, no evidence exists to confirm that these manuscripts were ever posted. 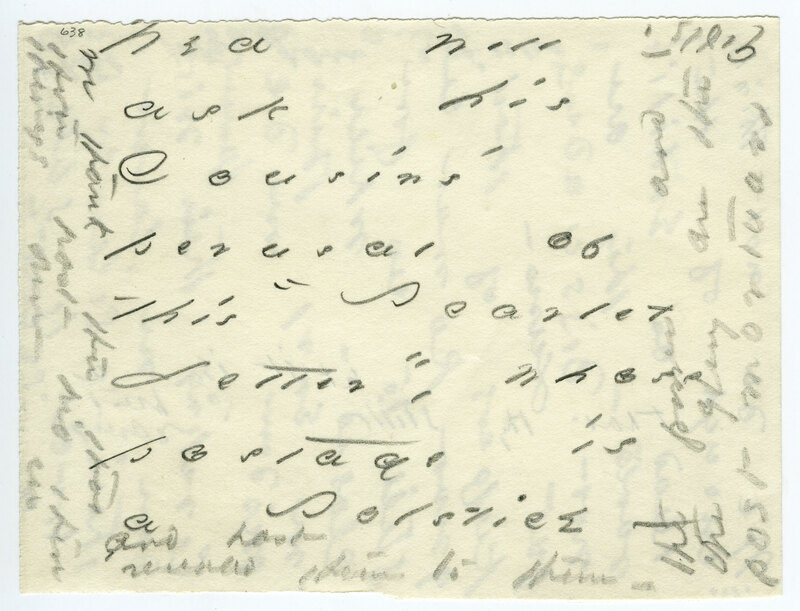 If versions of the letter-fragments were in fact mailed, to Lord or to another recipient, they would belong to a different category of Dickinson’s work. As Ralph Franklin’s edition of the Manuscript Books forcefully illustrates, facsimile editions of Dickinson’s manuscripts are crucial to the critical study of her work. First, since Dickinson did not see her work through the press but, like Blake, acted as author, publisher, and distributor of her writings, the copy text for her compositions will in almost all cases be the manuscripts. Second, though it is not possible, given the fragmentary state of Dickinson’s drafts, to propose a definitive typographical layout for the page, it is clear that after 1870 the interstitial design of the page—the isolation of words, the organization of the page as a series of suspenses, or blanks—is part of rather than supplementary to the content of her encodings. In this presentation, as in Franklin’s edition of the Master Letters, diplomatic transcriptions accompany facsimiles of the holographs.27 Although a typographic transcription cannot reproduce the singular forms of the manuscript characters, it can convey the movement of text on the page and the open and processual nature of the drafts and fragments while simultaneously clarifying the processes of composition. Here the position of words on the page and the spaces between them have been preserved as far as possible; “accidentals,” such as Dickinson’s directional dashes and flying quotation marks, are added by hand; and, deletions and mutilations on the surfaces of the manuscripts are, wherever possible, both graphically figured and narratively described. Still, practice has at times overwhelmed theory, and I have made a number of compromises. The greatest compromise concerns Dickinson’s spacing: while local spaces between words have been approximated, spaces between individual letters, often visually significant, have been dropped. Second, the varying sizes of Dickinson’s scripts, from the contracted hand of the rough copy drafts to the dramatically magnified hand of the fair copy drafts, have been standardized—12 point and 10 point type sizes indicate rough and fair copy drafts, respectively—and, in dramatic contrast to Dickinson’s handwriting, which almost always traverses the entire surface of the paper, the typescripts appear suspended in whiteness. Third, though many of the accidentals have been added by hand, the inflexibility of type still obscures the visual impact or interior code of Dickinson’s open Os, Us, and Ws as well as her frequent use of the cross of the T as both dash and underlining. Similarly, typesetting costs and technological limitations prohibited the representation of the angle of words or letters on the page. Occasionally, it is difficult to distinguish between Dickinson’s upper- and lowercase letters as well as between her dashes, commas, and extended periods: my decisions in these instances invite revision. Finally, the temporal condition of the manuscripts is irrevocably altered by their translation—retracing—from pencil into ink. Here evanescence itself becomes indelible. 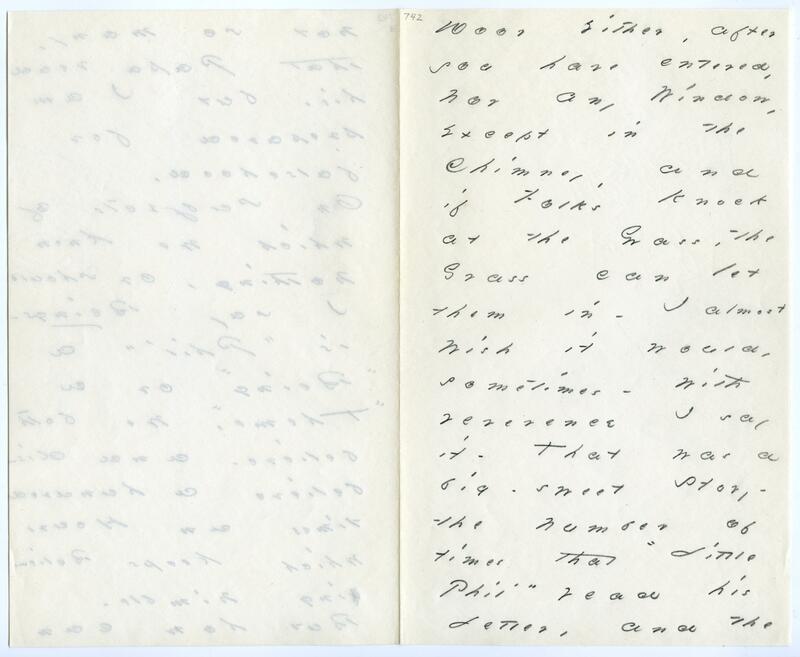 Like the transcriptions, the facsimiles of Dickinson’s manuscripts are only witnesses to a scene of original inscription. 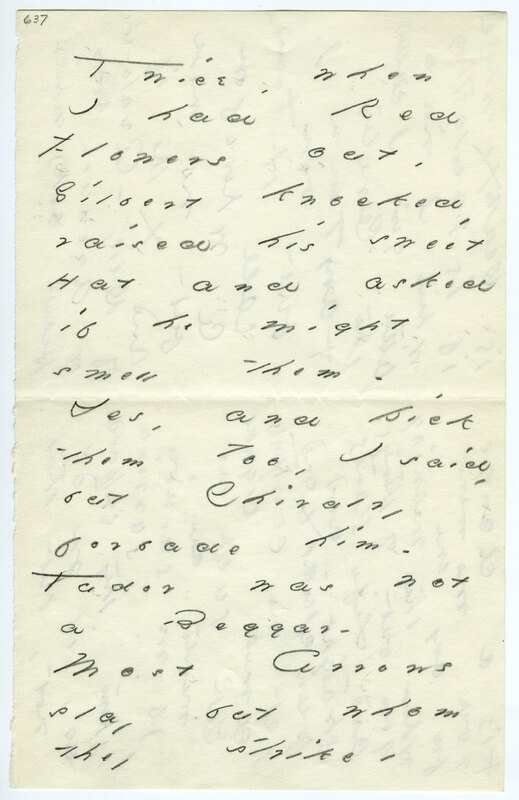 In even the finest photoreproductions both the materiality of the original documents and the three-dimensional nature of composition are lost: the colors, hefts, and textures of the various writing surfaces Dickinson used are no longer discernible, watermarks and embossments are often difficult to decipher, and folding marks are nearly invisible. 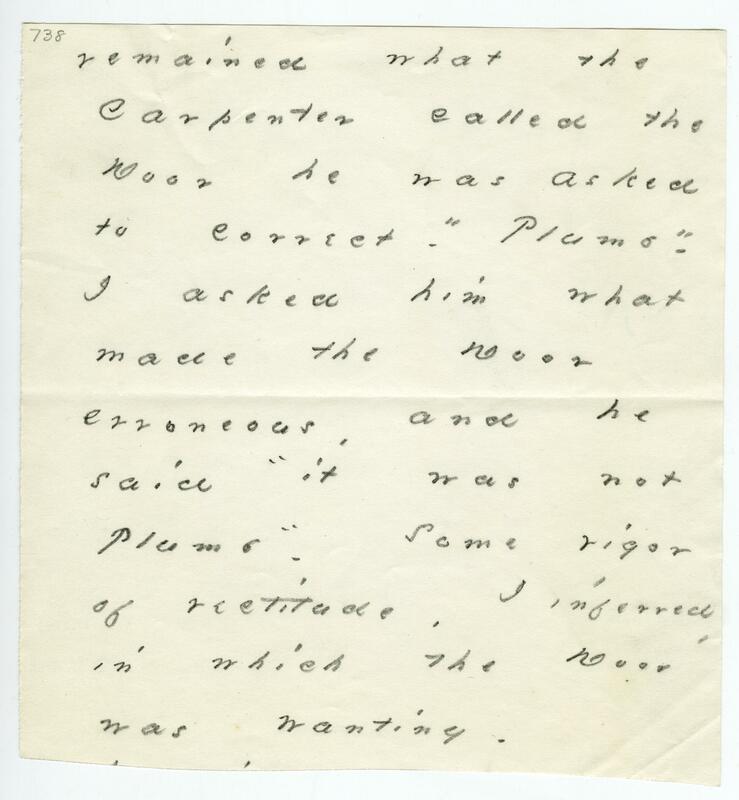 The captions accompanying the transcripts thus focus on the media evidence obscured by the processes of photoreproduction and typographical transcription. Entries for each draft include: (1) the Amherst College catalog number, (2) the range of dates assigned by Johnson, Leyda, and Franklin, (3) an enumeration of the kind of paper used and, if applicable, its watermark, (4) the number of extant leaves and the size of each leaf, (5) a physical description of folding patterns, pencil strokes, pin holes, erasures, missing pages, and mutilations, and (6) a brief relation of publication history. Markings made on the manuscripts by editors or catalogers have not generally been reproduced in the transcripts but are alluded to in the notes. Johnson’s Letters includes the sources of Dickinson’s literary allusions and quotations, and I have not repeated this information here. Since my object in “Open Folios” is to present the textual witnesses with a minimum of interference, editorial symbols are abandoned except in two instances. First, in those cases in which a part of a word or passage is undecipherable, I have bracketed the illegible material and suggested possible readings in the notes. Second, since the physical association of texts is not always clear in facsimile, I have recorded the catalog number of each leaf, added a notation detailing the number of sheets and leaves in each document, and, when necessary, added the word verso to indicate the back of a leaf of stationery or other writing surface. Finally, facsimiles of Dickinson’s manuscripts appearing in the body of the commentary are not accompanied by typographical transcriptions; consequently, the reader faces the otherness of the documents without a mediating agency. Many of these facsimiles will reappear in “Open Folios,” where a typographical transcription is supplied. In those cases in which I reproduce a Dickinson manuscript from the Amherst College Library or the Houghton Library but do not include a transcript in this edition, I give the corresponding reference in the Johnson and Franklin editions. Leyda, Johnson and Franklin assign dates to Dickinson’s compositions on the basis of internal evidence, handwriting, and paper groups.28 Yet, while Dickinson’s handwriting moves through three readily distinguishable phases—we may call them “early,” “middle,” and “late,” for convenience—the numerous conscious and unconscious variations within those basic styles, particularly after 1870, make it difficult to assign manuscripts to specific years, and a significant margin of error is inevitable. 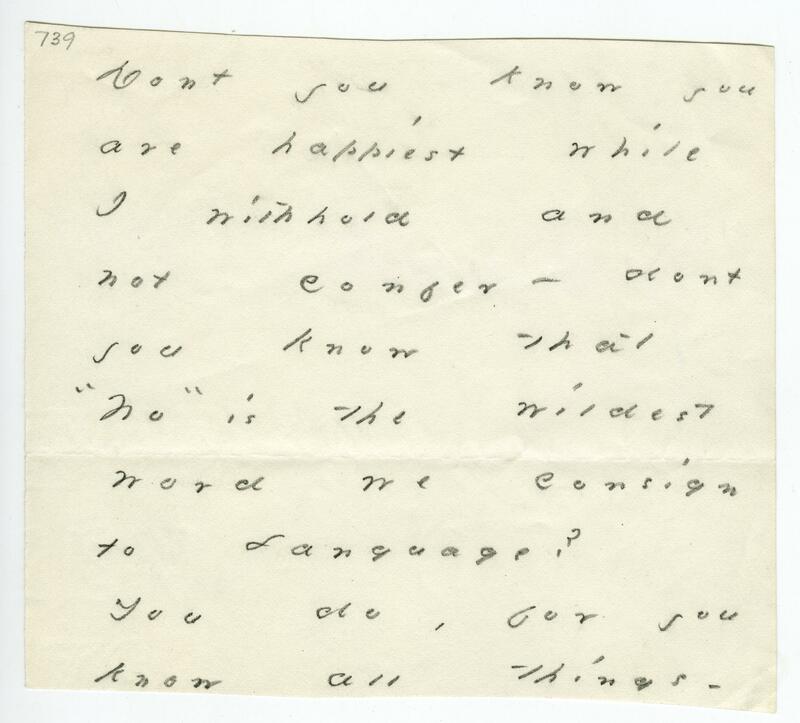 Moreover, the existing dating schemes were developed almost solely from interpretations of what Martha Nell Smith calls Dickinson’s “performance script,” the script she used in the fair copies, and do not fully take into account the more problematic hand of the rough and intermediate copies, in which distinct styles disappear almost entirely while isolated letters exist in highly unstable forms.29 In A 759, for example, no less than six different forms of T (t) can be identified, and other letters are similarly changeful. 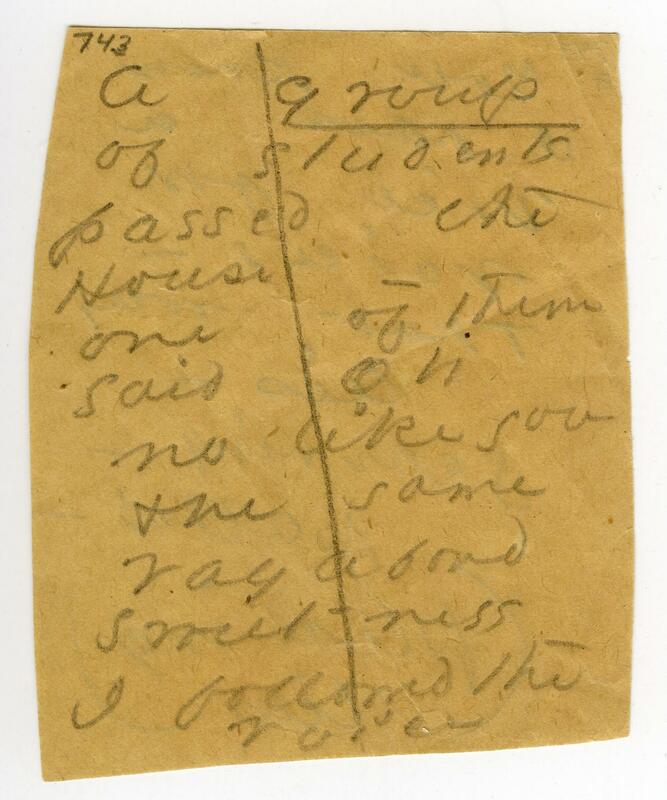 The stationery Dickinson used—its watermark and date—sometimes contributes to the material evidence regarding the date of composition. Such evidence is not, however, conclusive, especially since Dickinson almost certainly drew from a stock of paper that had accumulated for several years. Watermarks and dates thus indicate only the earliest possible date of composition (i.e., the year the paper itself was manufactured), never the actual date(s), and even documents that are bibliographical twins may have different composition/copying dates. Furthermore, a significant number of the manuscripts reproduced here are rough copy drafts written on brown paper or scraps of ruled notebook paper. In these instances the paper evidence rarely assists in establishing the date of composition. In the notes accompanying individual drafts I have included, whenever possible, information regarding the watermark and date of the stationery Dickinson used but have left the date(s) of composition open. The dates assigned, respectively, by Johnson, Leyda, and Franklin appear in brackets. In appendix 2 I have summarized the Bingham-Leyda-Johnson sequences in order that the reader may see where there is general concurrence respecting a date as well as where there is a divergence of opinion; in appendix 7 I have listed manuscripts according to paper groups.30 With the exception of four drafts that can be dated precisely on the basis of both external and internal evidence, this edition does not establish a definitive chronology or even a hypothetical sequence for these writings. On the contrary, the potential shifting of contents in this digital environment undermines the ambitious but “impossible” chronology of the variorum while also foregrounding the ways in which the act of “drafting” is itself ultimately subversive of all such orders. All of the drafts and fragments reproduced here were composed in pencil, which, according to Theodora Ward, Dickinson used habitually from approximately 1879 until her death in 1886.31 Several kinds of pencil were available in the nineteenth century—quill pencils, metallic lead pencils, black lead pencils, and even camel’s hair pencils—but the material evidence suggests that Dickinson used a form of the black lead pencil.32 In the fair copy fragments the pencil strokes are generally sharp and legible, while in the rough copy drafts the smudging of the graphite or the bluntness of the pencil nib renders certain passages difficult to decipher. The problem of smudging is compounded in those instances in which the color of the paper has changed from white or off-white to shades of yellow or brown. Unlike ink, however, pencil itself is not so subject to changes in coloration. 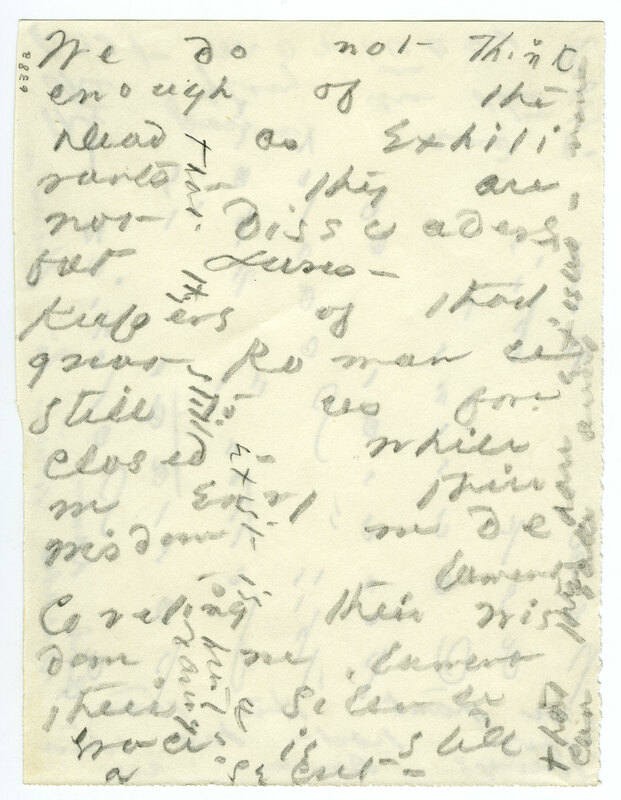 Although India rubber easily erased pencil marks, Dickinson seems rarely to have erased passages in these drafts, preferring to draw lines through deleted words or passages. 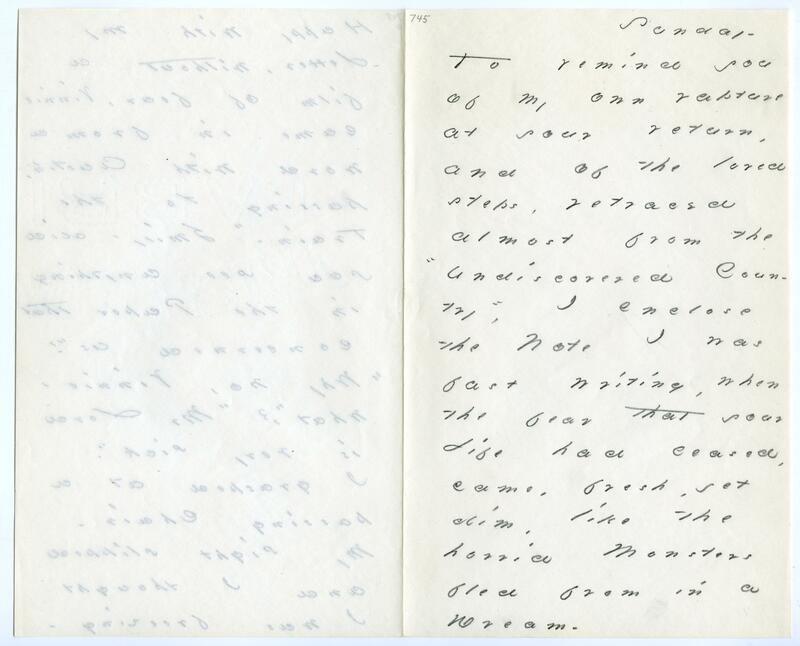 In addition to the manuscripts of the drafts at Amherst College, I refer throughout this work to two editions of Dickinson’s writing that include the drafts: Millicent Todd Bingham’s Emily Dickinson: A Revelation (1954) and Thomas H. Johnson’s The Letters of Emily Dickinson (1958). Although neither of these editions is “authorized,” Bingham’s Revelation may claim textual relevance as the earliest published source of many of the documents, while Johnson’s Letters (1958) claims relevance as the first and, until now, only scholarly edition of these documents. References to Jay Leyda’s work are to his contributions as cataloger of the manuscripts and not to his compendium, The Years and Hours of Emily Dickinson (1960), which, though an invaluable source of information, is not textually relevant. Although an index of individual poems and/or letters traditionally accompanies an edition, I have chosen instead to index material documents, thus accenting the corporeal aspects of the manuscripts along with their “history of physical disruption.”33 The process of indexing documents as opposed to individual drafts is, where Dickinson’s fair copies are concerned, quite straightforward: in each case the Amherst College catalog number identifies the leaves of a single manuscript. 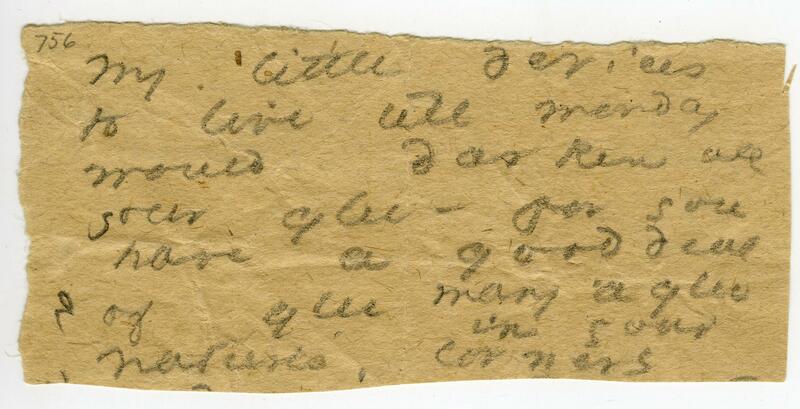 The rough copy drafts are more problematic, however, since Dickinson sometimes jotted drafts of two or more discrete compositions on the same side of a fragment of paper or on the recto and verso of a single scrap. In a few cases the Amherst College catalog numbers refer not to the writing surface itself but, instead, to the various texts traversing it (e.g., see A 132, A 132a, and A 133; A 193 and A 194). Readers familiar with Dickinson’s fascicles will recall that she often divides poems from one another by drawing a horizontal line between them. Such lines are also found in several of the rough copy fragments included here and may indicate the limit of a particular thought. On the other hand, the lines may also divide the increments of an extended thought. Boundaries are difficult to mark with certainty, and “first lines” (of texts, as opposed to documents) are occasionally a matter of the cataloger’s or editor’s judgment. Finally, though the drafts and fragments are listed in ascending numerical order, this order is entirely arbitrary and subject to change. 1. Roman Jakobson, “Dialogue on Time in Language and Literature,” in Verbal Art, Verbal Sign, Verbal Time, edited by Krystyna Pomorska and Stephen Rudy, with Brent Vine (Minneapolis: University of Minnesota Press, 1985), 20. 3. The texts of the Lord letters in Jay Leyda’s The Years and Hours of Emily Dickinson, 2 vols. (New Haven: Yale University Press, 1960) are “reading texts” and do not reflect the complicated and contradictory textual situation of the actual drafts and fragments. This kind of discrepancy, between manuscript and text, though not in itself uncommon, is mysterious given Leyda’s long and intimate acquaintance with the manuscripts. 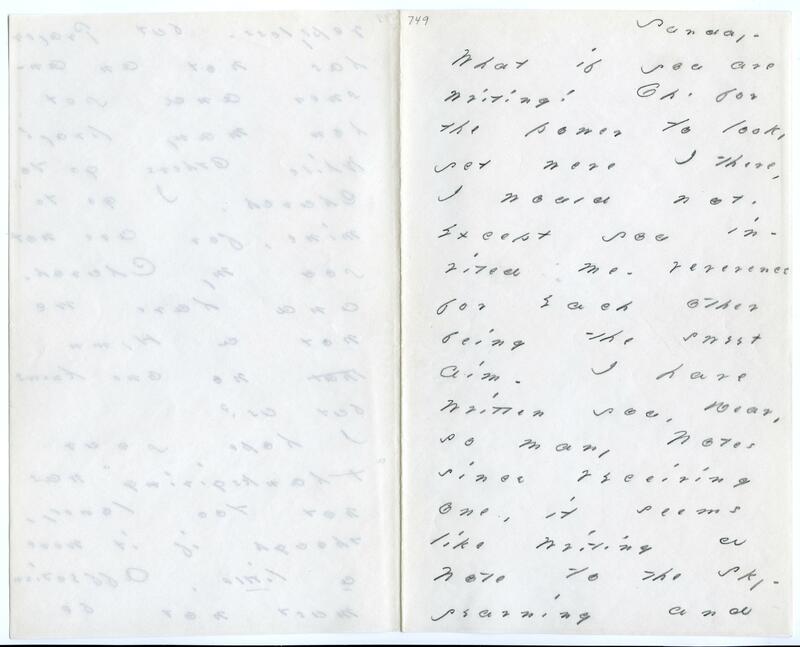 In the 1950s Leyda himself arranged and described the materials in great detail, carefully cross‑referencing the drafts and fragments allegedly to Lord with poems and fragments peripherally associated with the relationship. 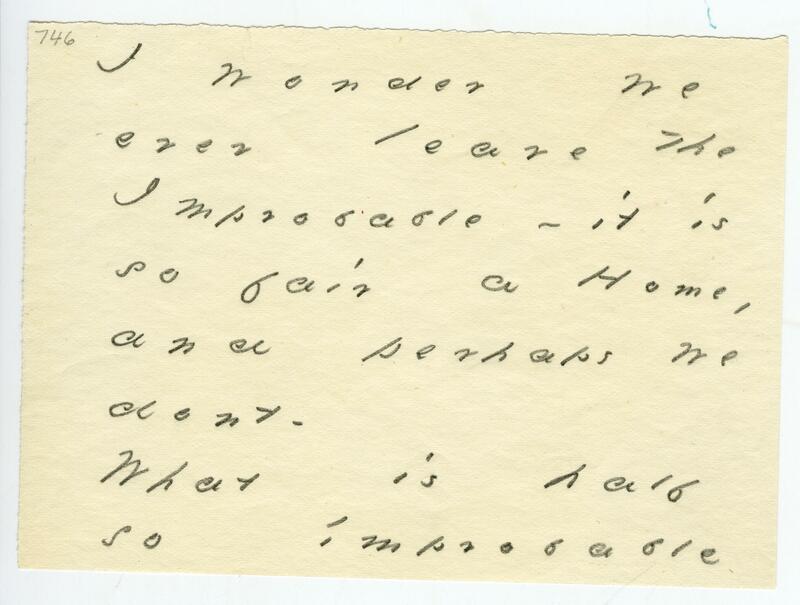 His notes, both on the catalog cards and on the cover sheets accompanying the photocopies of Dickinson’s original manuscripts in the Amherst College Library, are of great importance to the researcher. 5. 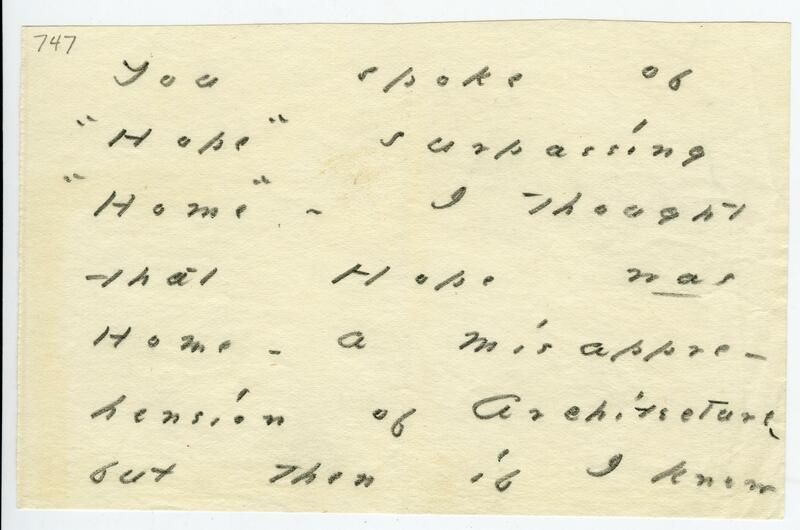 For an account of the familial struggles over Dickinson’s manuscripts, see Millicent Todd Bingham, Ancestors’ Brocades: The Literary Debut of Emily Dickinson (New York: Harper and Brothers, 1945). For another, more recent perspective on the family rift, see John Evangelist Walsh, This Brief Tragedy: Unraveling the Todd‑Dickinson Affair (New York: Grove Weidenfeld Press, 1991). 6. Bingham, Emily Dickinson: A Revelation, 3. In his book The Marriage of Emily Dickinson: A Study of the Fascicles (Lexington: University of Kentucky Press, 1983) William H. Shurr valuably points out that Bingham’s work in A Revelation is more polemical than scholarly. 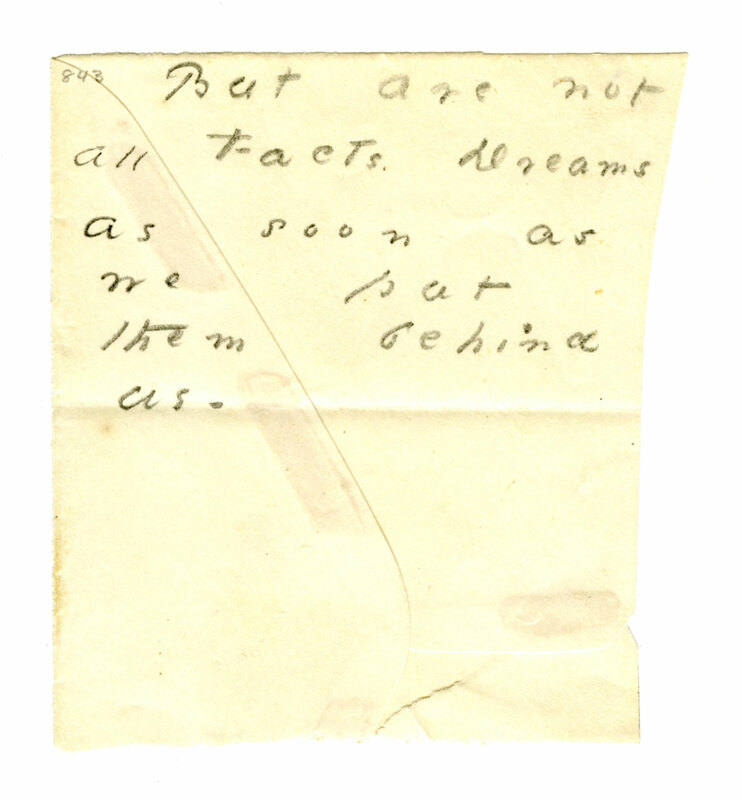 Another quite different assault on Bingham’s (Todd’s) credibility comes from Anna Mary Wells, who suggests that the letters in A Revelation are forgeries. 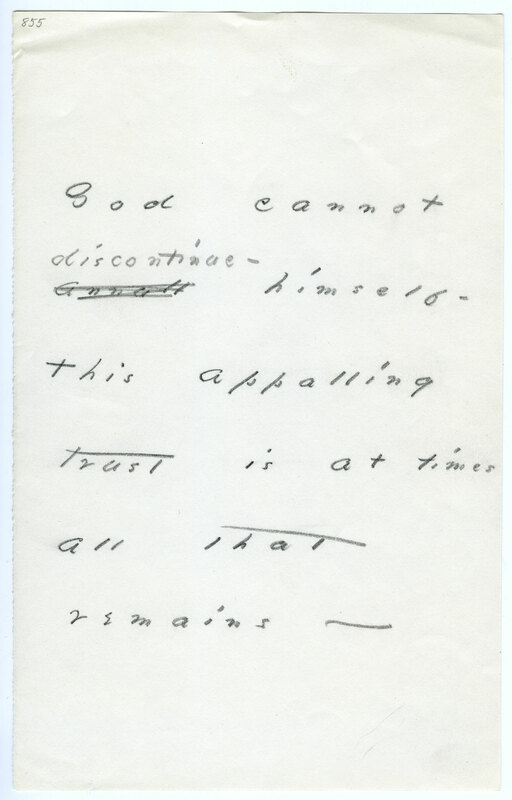 For Wells’s argument, see “Emily Dickinson Forgeries,” Dickinson Studies 35 (1979): 12–16. 7. Bingham, Emily Dickinson: A Revelation, 1–2. 10. R. P. Blackmur, “Emily Dickinson: Notes on Prejudice and Fact,” in Language as Gesture (New York: Harcourt, Brace, 1952), 25. 11. For a review of Harvard’s claims, see R. W. Franklin, The Editing of Emily Dickinson: A Reconsideration (Madison: University of Wisconsin Press, 1967), 116–17. 12. Jerome J. McGann, The Textual Condition (Princeton: Princeton University Press, 1991), 47. 13. Mark Storey, “‘Creeping into Print’: The Letters of John Clare,” in The Theory and Practice of Text‑Editing, edited by Ian Small and Marcus Walsh (Cambridge: Cambridge University Press, 1991), 63. 14. Jean-Louis Lebrave, “Rough Drafts: A Challenge to Uniformity in Editing,” Text 3 (1987): 135. 16. The idea of an edition in which the recovery of texts is not strictly linear has some important precedents. See, for example, Derek Pearsall’s call for a loose-leaf edition of Chaucer’s The Canterbury Tales, in “Editing Medieval Texts,” in Textual Criticism and Literary Interpretation, edited by Jerome J. McGann (Chicago: University of Chicago Press, 1985), 92–106. 17. Ian Jack, “A Choice of Orders: The Arrangement of ‘The Political Works,’” in McGann, Textual Criticism, 127. 18. In Rowing in Eden Smith reminds us: “To read the ‘Master’ letters to identify who ‘He’ is with the hope that, by coming to a better understanding of her heart’s desire, readers might more intimately analyze her poetic mind, brackets her artistic objectives as autobiographical” (124). The Lord letters have been subjected to precisely the same strategies of interpretation. 19. Jean‑François Lyotard, “Gesture and Commentary,” a lecture delivered at the State University of New York, Buffalo, March 1992. 20. See Mark Schulman, “Gender and Typographic Culture: Beginning to Unravel the Five-hundred Year Mystery,” in Technology and Women’s Voices: Keeping in Touch, edited by Cheris Kramarae (New York: Routledge and Kegan Paul, 1988), 98–115; emphasis added. 21. Maurice Blanchot, “Translating,” translated by Richard Sieburth, Sulfur 26 (1990): 82–86. Walter Benjamin’s work on translation is the source of much of Blanchot’s thought here. See Benjamin, “The Task of the Translator,” in Illuminations, edited, with an introduction by Hannah Arendt and translated by Harry Zohn (New York: Schocken Books, 1969), 69–82. 22. Quoted from Robert Duncan’s “An Essay Prepared for MAPS 6,” MAPS 6 (1974): 5. For an excellent discussion of the somatics of translation, see Douglas Robinson, The Translator’s Turn (Baltimore: Johns Hopkins University Press, 1991). 23. Randall McLeod, “Editing Shak‑speare,” Sub‑Stance 33–34 (1982): 38. 24. For a discussion of the state of Sappho’s textual body, see Willis Barnstone, The Poetics of Ecstasy: Varieties of Ekstasis from Sappho to Borges (New York: Holmes and Meier, 1983), 29–41. 26. Critical interpretations of the Lord letters have in part been determined by their editorial treatment. Since Bingham’s publication of Emily Dickinson: A Revelation (New York: Harper and Brothers, 1954), the drafts have most often been used as aids to the biographer seeking evidence of Dickinson’s “Master Passion.” Indeed, in The Hidden Life of Emily Dickinson (New York: Simon and Schuster, 1971) John Evangelist Walsh proposes Otis Lord as the “Master” Dickinson first addressed around 1858, a view he continues to espouse in This Brief Tragedy: Unraveling the Todd-Dickinson Affair (New York: Grove Wiedenfeld Press, 1991), in which he concludes, “It is not improbable, in fact, that Lord was the mysterious ‘Master’ of Emily’s middle years, the married man with whom she was so desperately and hopelessly in love.” These speculations are followed by Walsh’s fantasizing, “Had it not been for the stroke suffered by Lord early in 1882, it is nearly certain that Dickinson would have ended her days not as a village eccentric but as proud mistress of her own home and servants in Lord’s home town of Salem” (60). Moreover, even those critics interested primarily in Dickinson’s poetics often promote versions of the “Master Narrative.” In The Soul’s Society: Emily Dickinson and Her Culture (Cambridge: Cambridge University Press, 1984) Barton Levi St. Armand concludes his examination of Dickinson’s relationship to sentimental religion by writing, “Certainly, Emily Dickinson found and lost some Master who was already married and unavailable, whether it was the gruff, controversial Otis Lord, the dashing and magnetic Samuel Bowles, or the brooding, scholarly Charles Wadsworth. To this Master Emily Dickinson was the most devoted of disciples” (81). Elsewhere in the same work St. Armand refers to Lord as the “reincarnation” of the Master figure and “the acknowledged Master of [Dickinson’s] later emotional life.” Similarly, in The Dickinson Sublime (Madison: University of Wisconsin Press, 1990) Gary Lee Stonum identifies Lord as “the only real person who we can be sure did for a time occupy in Dickinson’s imagination the role of Master” (18). Vivian Pollack, though she does not advance Lord himself as a candidate for “Master” in Dickinson: The Anxiety of Gender (Ithaca: Cornell University Press, 1984), remarks that, “unless ‘Master’ is a complete unknown, a dubious possibility given Dickinson’s habit of tantalizingly incomplete self-revelation, the pattern of her relationships with other men, including Lord, confirms my belief that if Wadsworth was not the ‘one more’ who ‘left the land,’ someone very much like him was” (99–100). My work initiates a break with this critical line by proposing that the most powerful “revelations” of the drafts and fragments are not biographical but, rather, textual. 27. 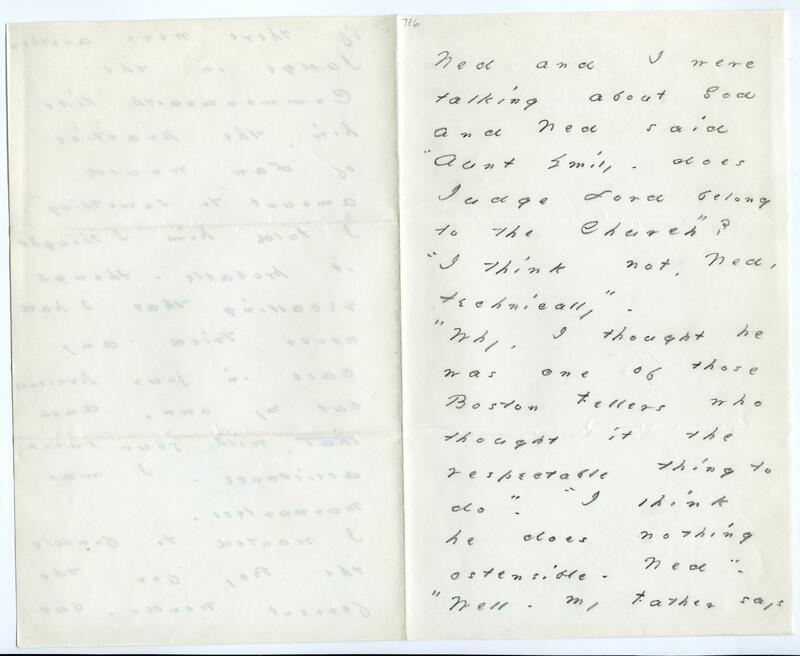 The only other facsimile edition of Dickinson’s letters currently available is Ralph W. Franklin’s edition of The Master Letters of Emily Dickinson (Amherst: Amherst College Press, 1986). I am deeply indebted to Franklin’s pioneering work here and elsewhere. 28. Thomas H. Johnson, “Establishing a Text: The Emily Dickinson Papers,” Studies in Bibliography 5 (1952–53): 21–32. 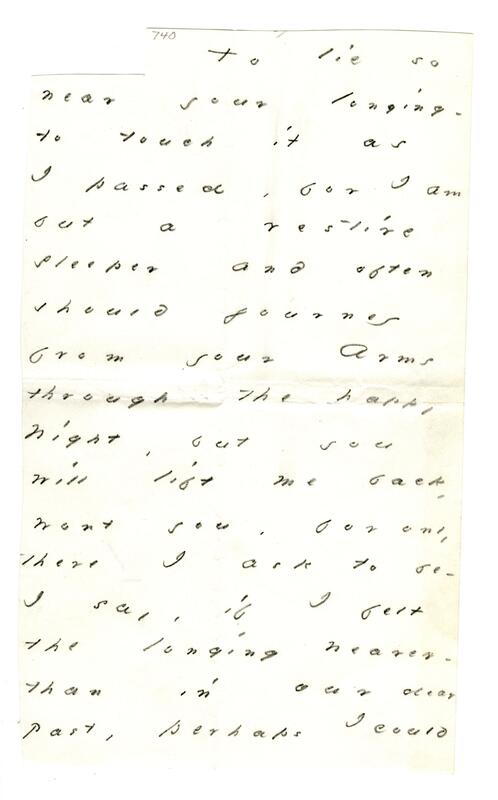 All of Dickinson’s editors have used her handwriting as a primary key to dating her poems and letters. 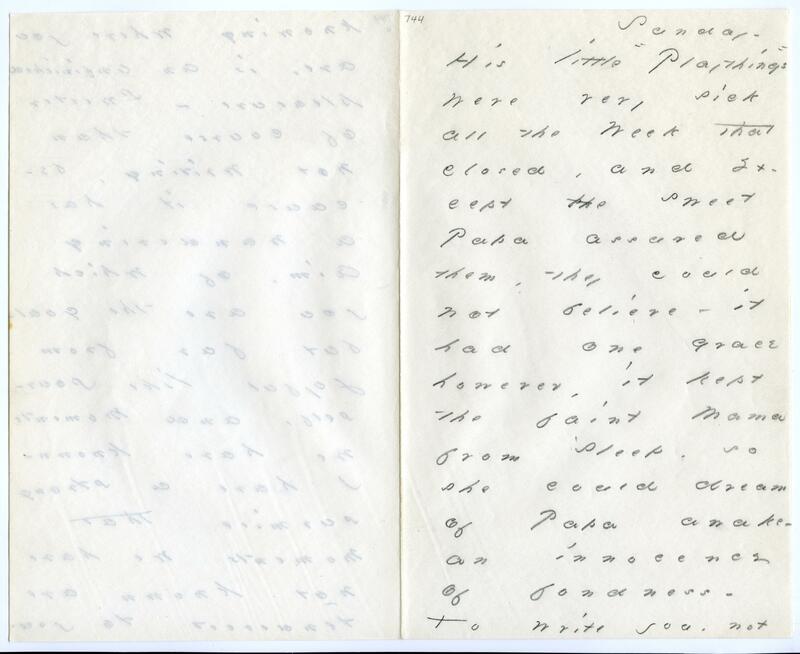 The most detailed study of Dickinson’s late handwriting I know of is Theodora Ward’s “Study of the Handwriting,” in appendix D of her edition of Emily Dickinson’s Letters to Dr. and Mrs. Josiah Gilbert Holland (Cambridge, Mass. : Harvard University Press, 1951). 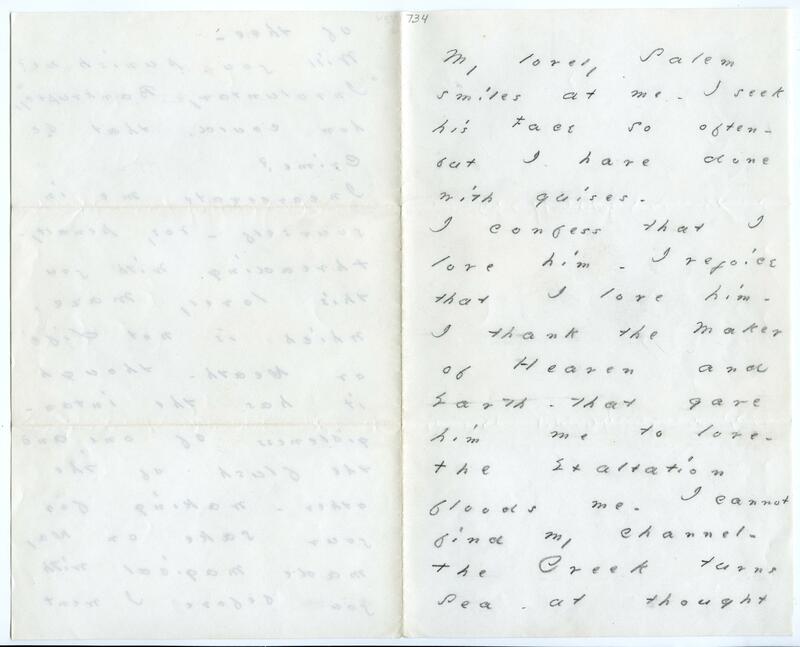 Ward’s analysis focuses on linked letters, changes in forms of letters, capitals, and size and slant of script in manuscripts composed between 1870 and 1885. Her work includes twelve holograph reproductions, accompanied by notes. 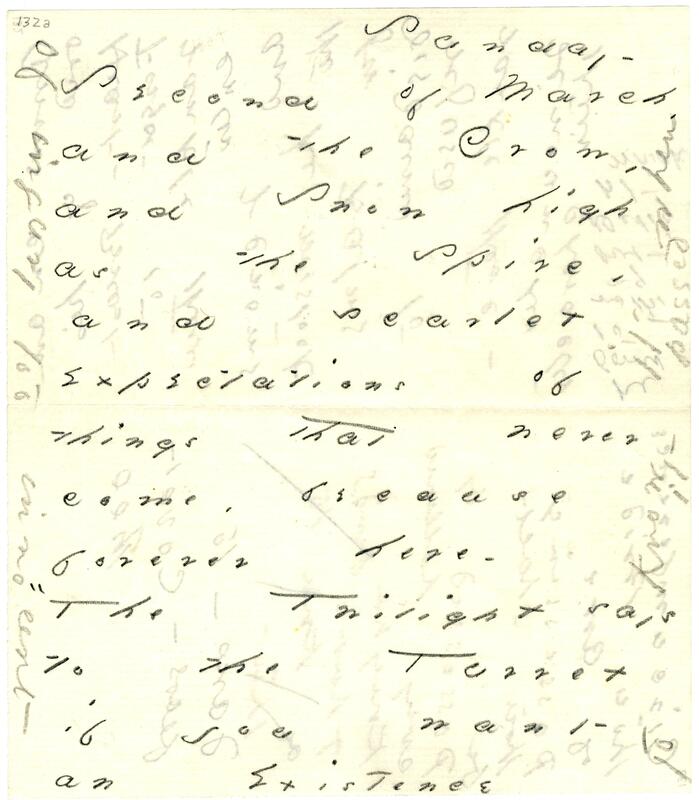 Although I do not share Ward’s confidence that an editor may assign precise dates to Dickinson’s manuscripts on the basis of handwriting alone, her careful work is important to the textual scholar. See also Ward, “Characteristics of the Handwriting,” in The Poems of Emily Dickinson, 3 vols., edited by Thomas H. Johnson (Cambridge, Mass. : Belknap Press of Harvard University Press, 1955), xlix–lix; and “The Finest Secret: Emotional Currents in the Life of Emily Dickinson after 1865,” Harvard Library Bulletin 14 (Winter 1960); and Ralph W. Franklin’s more recent notes on handwriting, in “The Emily Dickinson Fascicles,” Studies in Bibliography 36 (1983): 1–20; and his “Introduction,” in Master Letters, 5–10. 29. Martha Nell Smith, Rowing in Eden: Rereading Emily Dickinson (Austin: University of Texas Press, 1992), 63. 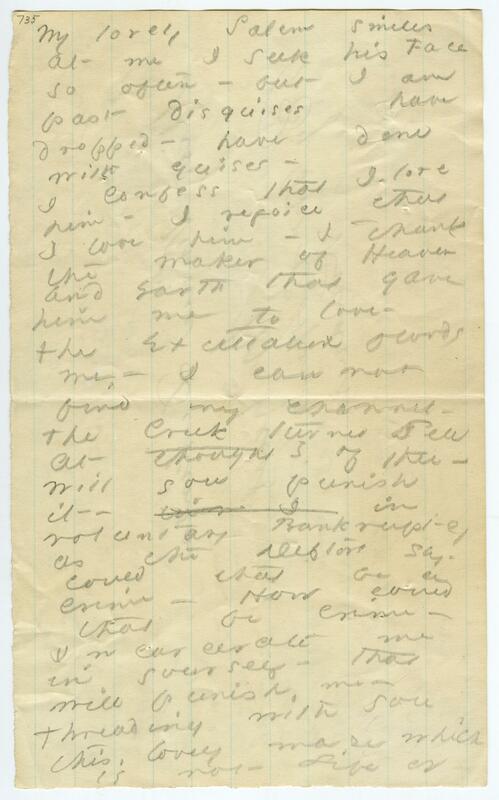 Although Smith generally agrees with Johnson’s and Franklin’s dating schemes—“give or take a year of so”—she emphasizes the danger of attempting to assign “precise, indisputably accurate dates” for Dickinson’s compositions on the basis of handwriting alone (123). Rebecca Patterson, in her essay “On Dating Dickinson’s Poems,” American Notes and Queries 12 (February 1974): 84–86, also points to the difficulty of assigning dates on the basis of handwriting, especially given the possibility that a large number of Dickinson’s manuscripts may have been destroyed and are thus unavailable for comparison. 30. 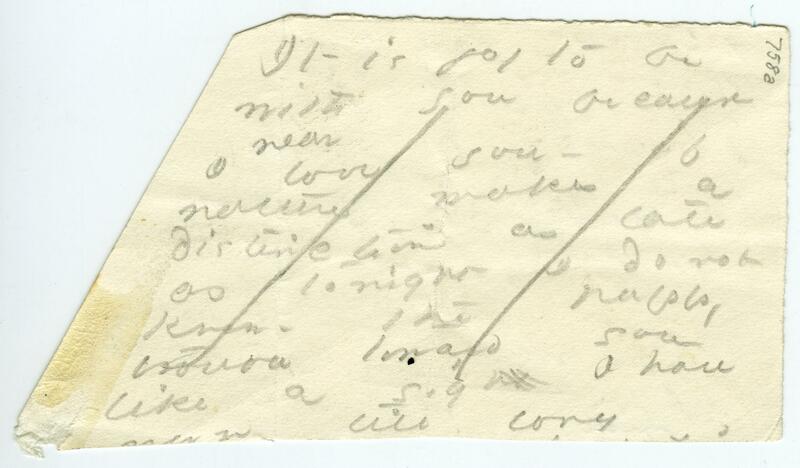 Ultimately, it will be necessary to compare a much larger number of documents written on similar types of stationery. Again, Theodora Ward’s work is important. In “A Study of the Papers Used,” in appendix C of Emily Dickinson’s Letters to Dr. and Mrs. Josiah Holland, Ward lists twenty-four paper groups, noting the characteristics and the possible range of dates of each group. At least four of the groups are relevant to this study: 19 (weston’s linen / 1876, Mid-January 1879–Late summer 1881); 20 (The / american / Linen Paper, Late October 1881; October 1882–Early May 1883; 1 June 1884–March 1885); 22 (weston’s linen record / 1881, 19? December 1882; 3 March 1883–Spring 1883; Summer 1884; February 1885–Spring 1885); and 23 (Pure Irish Linen [script] / F. H . D. & Co., After Christmas 1882–Early 1883; Late September 1883–Early 1884; March 1884). 31. Ward, “Characteristics of the Handwriting,” lvii. 32. For a history of the pencil, see Henry Petroski, The Pencil: A History of Design and Circumstance (New York: Alfred A. Knopf, 1990). 33. Franklin, “Emily Dickinson Fascicles,” 1.